The CACRoP is a growing community of practitioners, facilitators, scholars, parents, and activist committed to the advocation, study, development, and practice of an African-centered rites of passage process. The coalition is open to anyone who advocates for African-centered rites of passage as the fundamental process by which an authentic African sense of self is developed. The Creator does not create for failure. All humans are one with the Cosmos (the Creator and creation). Every person has the capacity to succeed. We are born with a driving intent to express the capacity to succeed. When the intent of the Creator is not met with appropriate content, a person’s potential for success is ruined. Inappropriate content brings reaction, and not intellectual growth, and the child’s ability to interact (use his or her intelligence) falls increasingly behind. Thus, the further one’s intelligence falls behind, the more energy must go into compensation. With the infusion of inappropriate content, the young person’s intelligence is still out there in the previous passage, trying to make functional [sense] the intent of the Creator. He who does not cultivate his field will die of hunger. 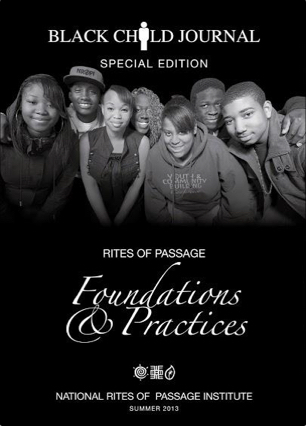 Rites of Passage in the child’s education provides a meaningful response to the intent. The success of the Creator’s plan hinges directly on the person (infant, child, adolescent, or adult) being provided with content proper for the intent of that person. All persons who experience this type of education will benefit from it. Akan Day Names & Calculate your birth "day"
"I knew I was a man when ..."
The effectiveness of African-centered Rites of Passage to transition first year college students. Join the CACRoP on acebook. Effectively manipulate the political system in which you find yourself (i.e. that operates in your community). Strategize to express the authentic self through one's unique genius. "African Centered Rites of Passage"
A Participant Observation Case Study Using Van Gennep's Rites of Passage Theory at a "Summer Transitional Program"